Identify the pipes that will be most affected or most vulnerable to freezing…inside and outside of your home or business. Pipes in unheated areas in your home or business can become problems in cold weather. Insulate all water pipes in unheated areas to prevent freezing and subsequent thawing and bursting. Foam insulation works well. This insulation can also reduce the amount of water that must be run before hot water is discharged from faucet or showers. 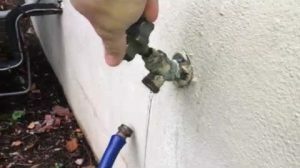 If you see a leak, don’t hesitate to fix it. If you cannot fix the leak yourself, call a professional plumber to remedy the problem before it becomes a major expense. To further safeguard pipes, especially in uninsulated areas, open any cabinet doors under sinks, particularly those located on outside walls. This allows the warmer room air to help prevent freezing. Turn off the water that leads to the spigots outside your house. Drain the lines and leave the spigots open during the winter. Shut down and thoroughly drain all lawn irrigation systems. Check meter pit covers to assure that they are securely bolted down and intact. If you don’t feel comfortable doing it yourself, call in a professional. Attention snowbirds! If you are snow birding to warmer climates, or going away for a lengthy time during the winter, consider shutting off your water pump and water heater.